I have complicated feelings about Halloween. Or not; the truth is I just don't like it. Once you reach a certain age (and by that I mean 33 and childfree, which means you don't have small ones to dress up and you also can't drink like you used to) Halloween loses some of its charm. I don't like the pressure of having to come up with a costume or the money I inevitably spend on it. I don't like the temptation of candy around every corner (Reese's Pieces, I can't quit you.) I do like handing candy out to small children, but my neighborhood doesn't get much foot traffic, and even if it did I'm pretty sure my large, loud, over-protective dogs would ruin the moment. So, yeah. If it was up to me, I'd skip Halloween and go straight to Thanksgiving. This year, however, I couldn't escape Halloween. As it turns out my place of employment takes Halloween very, very seriously. As in all work halts on Halloween day, we're treated to a catered lunch, and we hold an elaborate costume contest. And these aren't costumes you can pick up at Target or Wal-Mart. Oh, no. Most of the costumes are handmade, include elaborate wigs or makeup, and are super creative. Also we get to go home early, so maybe Halloween isn't so bad after all. While I looked forward to the party, there was still the problem of my own costume. As usual, I waited until the last minute. As usual, I wanted to spend as close to 0 dollars as possible. So I combed my closet and there, in the very back, I found my robe from graduation. Hm, I thought. What could I do with this robe that I wore once but am inexplicably keeping despite the fact that I am never going back to school ever again? What, indeed? If you read the title of this post, you know the answer. Supreme Court Justice Ruth Bader Ginsburg. It was perfect, really - the past few years, when I've dressed up, I've gone as iconic women. Amelia Earhart. Frida Kahlo. And now the Notorious RBG. This costume was the easiest too, which makes Ruth my favorite so far. 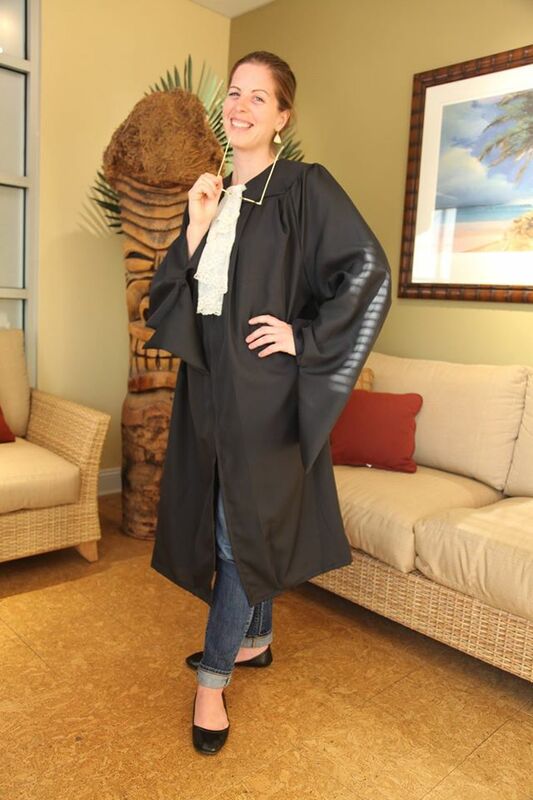 Graduation robe ($0.00). A pair of fake wire rimmed glasses I found at the costume store ($2.99). 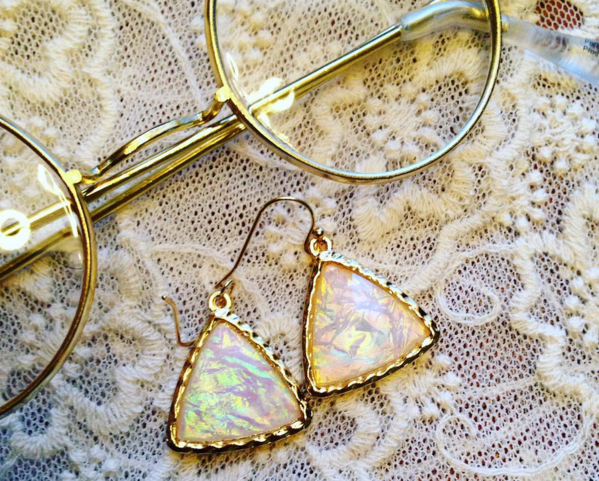 A pair of old lady earrings ($3.99, and my new favorite pair). And a yard of lace, which I folded and pinned to look like a stately ascot ($4.99). Done and done, for a grand total of $12.00. Justice is served. I loved my costume, but I didn't win the contest. The competition was stiff and having to explain to everyone who I was kind of took away from the experience. (My colleagues aren't up on their Supreme Court Justices, it turns out.) That's okay, though. I don't need to win Halloween. I just need to make it through the holiday so I can start planning my Thanksgiving menu. Mission accomplished. Do you dress up for Halloween? What's your best costume? I can already tell I'm going to have to up the ante for next year's office party, so please share!